AllThingsDigitalMarketing Blog: The 2015 Oscars ♦ ♦ ♦ Who do you think will be the winners? Here are my picks. 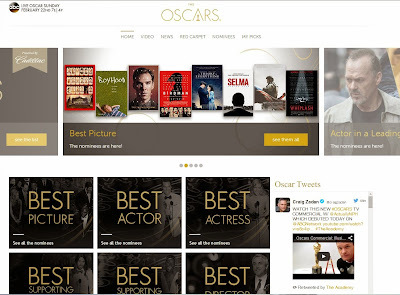 The 2015 Oscars ♦ ♦ ♦ Who do you think will be the winners? Here are my picks. The 87th Academy Award (Oscar) nominations were announced January 15th (at approximately 05:31 am GCT) live from the Samuel Goldwyn Theater in Beverly Hills, Calif, by Star Wars: The Force Awakens director J.J. Abrams, Gravity director Alfonso Cuarón and Into the Woods actor Chris Pine. Cheryl Boone Isaacs, President of Academy of Motion Picture Arts and Sciences, was also present. Amazing that Meryl Streep received her 19th Oscar nomination -- she already holds the record as the actor with the most Oscar nominations ever by man or woman. The second highest nomination number lags behind her score by 36% less with 12 nominations each -- Katharine Hepburn and Jack Nicholson. “Selma,” Ava DuVernay’s biopic about Martin Luther King Jr. received two nominations for best picture and best original song (for Common and John Legend’s recent Golden Globe-winning “Glory”). “Foxcatcher” – 5 (Great biopic crime drama, but I don't think this will win any Oscars) Maybe 1 or 2; Unusual receiving nomination for Best Director but not Best Picture -- the last time this was the scenario was back in 2008 when director Julian Schnabel was nominated for The Diving Bell and the Butterfly. The Oscars will be broadcast live from Hollywood's Dolby Theatre on Feb. 22 at 7 p.m. ET. Neil Patrick Harris will host the ceremony, which will be televised in more than 225 countries. This year there are 8 nominees for best picture (2014 and 2013 had 9 nominees for best picture). According to critics there are quite a few disappointments particularly snubbing "Selma" for acting categories and also Selma female director Ava DuVernay, "The Lego Movie," not nominating Timothy Spall for Best Actor for “Mr. Turner," etc. The Oscars are voted on by members of the Academy of Motion Picture Arts and Sciences. More information on the voting process is available at the Academy's website. Best Picture: (My pick either "Boyhood" or "Birdman") I've selected "Boyhood" as my pick on Oscar.com site....the fact that it took 12 years to produce is why I think will make this a winner over "Birdman." Although "Birdman" was exceptional and probably should win this category. I think it will go to "Boyhood." Hope I'm wrong. YAY I WAS WRONG ! WINNER:"BIRDMAN"
Best Actor in a Leading Role: (My pick difficult one, I've narrowed it down to 3 Bradley Cooper, Michael Keaton or Eddie Redmayne although Steve Carell was also great) My pick on Oscar.com is Michael Keaton -- Keaton really should win this. However, the BIG HOWEVER... if politics get in the way (George Lucas does not believe in the Oscars and labels it as political and he may be correct.). If Keaton doesn't win....I will have to agree with Lucas that the Oscars are nothing but political nonsense. If they pick Redmayne over Keaton, although he was okay in the role, the part was not a difficult part to play and the movie lacked depth which limited his potential of a great performance even more. I mean, really limping around with props on his knees and oversized shoes for effect in difficulty walking with the disease, playing a cripple in a wheel chair. There was much more to Stephen Hawkings and did not show up in the movie. Keaton had the most difficult part of all the nominees and should win by a landslide. I CANNOT BELIEVE HE WON THIS. THIS IS SURPRISING. WINNER:"EDDIE REDMAYNE"
♦ Benedict Cumberbatch, "The Imitation Game"
♦ Michael Keaton, "Birdman or (The Unexpected Virtue of Ignorance)"
♦ Eddie Redmayne, "The Theory of Everything"
♦ Ed Norton, "Birdman "
♦ Felicity Jones, "The Theory of Everything"
♦ Rosamund Pike, "Gone Girl"
♦ Patricia Arquette, "Blue Jasmine"
♦ Emma Stone, "Birdman or (The Unexpected Virtue of Ignorance)"
Best Animated Feature Film: (My pick between "How to Train Your Dragon 2" and "Song of the Sea") My pick on Oscar.com "How to Train Your Dragon 2" WINNER:"BIG HERO 6"
Best Cinematography: (My pick: toss up between Birdman and The Grand Budapest Hotel) My pick on Oscar is "Birdman" should win. The effective continuity in the film makes this a clear winner. That technique is so difficult to pull of and it was done spectacularly. WINNER:"BIRDMAN"
Best Costume Design: (My pick: "The Grand Budapest" Hotel or "Into the Woods" My pick on Oscar, "The Grand Budapest Hotel" WINNER: "THE GRAND BUDAPEST HOTEL"
Best Directing: (My pick: "Birdman or (The Unexpected Virtue of Ignorance)" or "The Grand Budapest Hotel") My pick on Oscar "Birdman"
Best Documentary Feature: MY pick between "The Salt of the Earth" and "Citizen Four." My pick on Oscar.com, "Citizen Four" WINNER:"CITIZEN FOUR"
Best Documentary Short Subject: My pick here and on Oscar "Crisis Hotline: Veterans Press 1." Compelling documentary deals with emotional, financial and physical challenges of our veterans. The ohter documentaries are good but none come close to the depth "Crisis Hotline: Veterans Press 1." WINNER:"CRISIS HOTLINE: VETERANS PRESS 1"
Best Film Editing: I can't believe "Birdman" didn't get a nominee here. I would have picked "Birdman," instead, 2nd close is "American Sniper." My pick on Oscar "American Sniper" WINNER:"WHIPLASH"
Best Foreign Language Film: My pick "Ida," and I've also picked "Ida" on Oscar.com. WINNER:"IDA"
Best Makeup and Hairstyling: (My Pick: "The Grand Budapest Hotel" or "Guardians of the Galaxy") My pick on Oscar, "The Grand Budapest Hotel." WINNER:"THE GRAND BUDAPEST HOTEL"
Best Music (Original Score) My pick "The Grand Budapest Hotel," and I picked this Oscar.com too. I can't imagine them picking Theory over Budapest, really that would be disppointing. I mean to give the Oscar to Theory because it is going to lose on everything else and needs to get an Oscar is simply political nonsense. WINNER:"THE GRAND BUDAPEST HOTEL"
Best Music (Original Song): My pick "Glory" and I also chose that one on Oscar.com as well. I chose this one not for the sake of diversity but it is a winner. I'm really sick and tired of the complaints about not enough diversity and I believe critics needs to get a life and move on about not enough diversity/too much diversity, etc. This is not a diversity context, it's the Oscars. WINNER:"GLORY"
Best Production Design: (My pick "The Grand Budapest Hotel") My pick on Oscar.com "The Grand Budapest Hotel," although "Birdman" was exquisite and should have been nominated, Grand Budapest will win over the others but not if Birdman were included in the list. WINNER:"THE GRAND BUDAPEST HOTEL"
Best Short Film (Animated): My pick here and on Oscar.com "The Bigger Picture" WINNER:"FEAST"
Best Short Film (Live Action): My pick here and on Oscar.com "Boogaloo and Graham" WINNER:"THE PHONE CALL"
Best Sound Editing: (My pick: “American Sniper") My pick on Oscar.com also "American Sniper" WINNER:"AMERICAN SNIPER"
Best Sound Mixing: (My pick: “Interstellar" or "American Sniper") My pick on Oscar.com "American Sniper" WINNER:"WHIPLASH"
Best Visual Effects: (My pick: Toss up between “Captain America: The Winter Soldier" or "Interstellar) My pick on Oscar.com "Interstellar" WINNER:"INTERSTELLAR"
Best Writing (Adapted Screenplay): (My pick: toss up between “The Theory of Everything" and "Whiplash") My pick on Oscar.com, "Whiplash"
Best Writing (Original Screenplay): (My pick: toss up between "Birdman or (The Unexpected Virtue of Ignorance," "The Grand Budapest Hotel," or "Boyhood") My pick on Oscar.com, "The Grand Buapest Hotel" although "Birdman" was exceptional, Budapest will probably win. DUGH, I WAS WRONG AND SO GLAD BIRDMAN GOT THIS ONE TOO. WINNER:"BIRDMAN"
Last year I got 85% right on Oscar.com. Wonder what my score will be this time. Whatever my score this year, I'll share it on Facebook and this blog. Any photos are courtesy of Wikimedia unless otherwise noted. All other photos will be credited as required. Please visit this blog frequently and share this with your social media. Thanks.